Today marks the opening of the Secular Majority project. 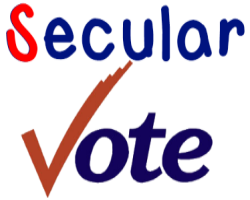 Secular Majority is ‘an independent, non-partisan, grassroots network of organizers, activists, and voters with the mission of identifying, supporting, and aiding in the election of qualified candidates committed to secular government and civic equality for Secular Americans’. The time has come to have an independent grassroots group who’s goal is to let secular voters know which candidates support their values. This entry was posted in Entanglement, Groups, Politics and tagged church and state, grassroots, secular government, Secular Majority, secular values, secular voters, voter's guide, voting on August 12, 2014 by Doug.